Cemetery located about 50 Rods N.W. of State Highway 25 [ Old Michigan Road ] the point on [N.W. side] of said highway where the C.E. Rhodes Barn stood & about 25 rods S.E. of Keren A. Neff Ditch. Cemetery about 1 mile N.N.E. of main crossroads of HAMLET & METEA & is about midway between ROCHESTER and LOGANSPORT . It’s location is now [1942 ] marked only by a cairn of rocks [15 ft. x 16 ft. x 3 ft. high] & west of the cemetery [about 25 rods] south of extreme N. line of Sec.45 of Michigan Road lands, & is near the east edge of the N.E. 1/4 of the N.W. 1/4 of Sec.45, T.28 N., R.2 E., 2nd Ind. P.M. SEE MAP. In 1836 & 1837, JOHN CONN, a pioneer settler of Bethlehem township entered & obtained by patent from the government, the S.1/2 of the N.W. 1/4 Sec.11, T.38 N., R.2 E;. and 7 years later [11-1-1873], gave 61.72 acres of it to his son Ferdinand C. Conn who about 12 years later  was joined by his [Ferdinand’s] wife, Sarah Conn, [they having by that time gone up the Old Michigan Rd. to Jackson County [South of Lansing], Michigan & sold the farm to Noah Martin which is recorded in the Logansport, Cass County courthouse, [Tract Bk. & D.R. “N.,”Pg.504 et seq. but some of the descendents of this John Conn are still living [May-9-1941] in or near the town of Fulton in southern Fulton Co., IN. about 5 E. of this old cemetery. See also L’Anguille Valley Memorial Association report on Burket Cemetery , Jefferson Twp., Cass Co., IN & Kingman Bros., 1878 map of Bethlehem Twp., Cass Co., IN., which shows a James Buchanan Jr. owning part of nearby Section 11 of Bethlehem Twp., in the same section with John Conn with whom we are at the moment concerned and only a mile or more N.E. of Conn Cemetery. Instead of burying their loved ones on their own farms, the Conn’s, Buchanan’s, and perhaps other very early Pioneer families of Bethlehem Twp., are said to have used a little Pottawattamie Indian burial-ground, presumably with the full knowledge, consent and approval of their Pottawattamie Indian friends who distinguish their American graves from the graves of the Indians, the pioneers are said to have marked them un-inscribed but with attractively-colored and suitable sized boulders. 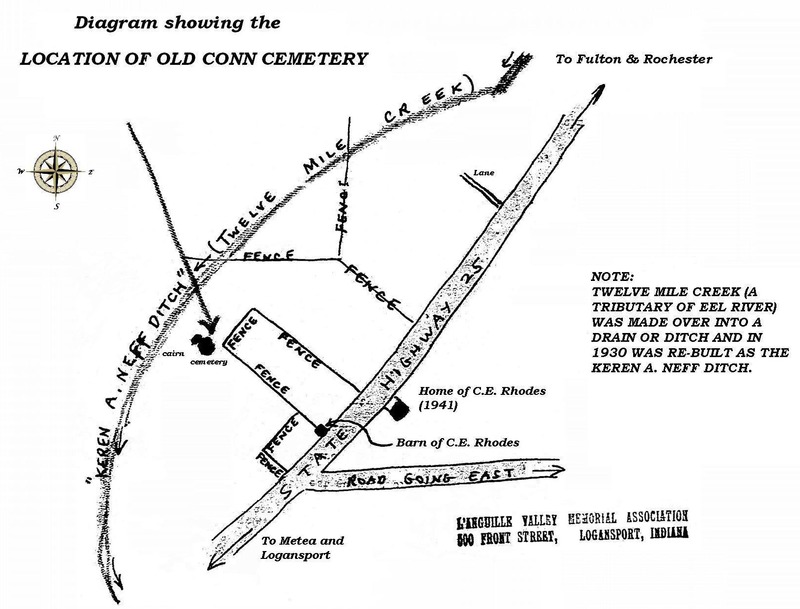 The only Non-native American’s now known to have been buried in the Conn cemetery are four persons [all said to have been of the log-cabin household of John Conn.] and All 4 of these persons remains are said to have been removed to the Metea Baptist Church cemetery about the time of the end of the Civil War; and the remains of other Americans who were originally buried here were also moved to other cemeteries leaving only the remains of the Native American Pottawattamie Indians buried in this cemetery & it is those whom we are concerned with here. All four of the forgoing persons' remains are said to have been removed to the Metea Baptist or other nearby cemeteries at the time of (or shortly after) the close of the Civil War; and the remains of some other Americans who had originally likewise been buried in this little Conn Cemetery may likewise have been so moved, leaving, it is thought, only Indians still buried in the cemetery with which we are at the moment concerned. Many years ago certain people wanted to excavate these Native American graves & the late Mr. John Rhodes [property owner], said very soberly & firmly “Let Them Rest in Peace.” There have been no desecration therefore of the graves of the Pottawattamie Indians who were such good friends to the American Pioneers that they opened their burial ground for the loved one of the new pioneers when death which knows no distinction between the races of men opened the doors of the cabins of the American newcomers. Comment: A. Rev. James Buchanan who died 9-17-1843 is buried in the old 9th Street Cemetery in Logansport, IN was not only prominently connected with the founding of the old First Presb. Church in Logansport but also the Bethlehem Presb. Church, [now S. of Metea] but formerly much closer to the Conn cemetery may have been the grandfather of the Babe buried here. An eastward running Indian trail is known to have passed close to this cemetery. This report was transcribed by Pat Fiscel for the Cass County INGenWeb Project, February 2007.